"Lucy is now 3 years old. She is a wonderful companion. Lucy remains protective, but is also social and fun." The Hovawart originates from Germany. 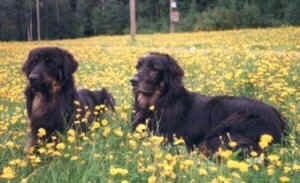 It is a very old working breed descended from the Newfoundland, Leonberger, and possibly the Hungarian Kuvasz. The goal of its developers was to re-create the great estate guarding dog of the Middle Ages. The Hovawart is rare in the USA, but popular in Germany. 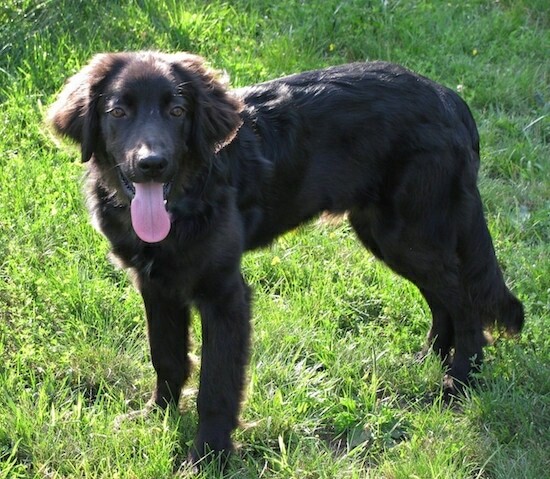 Eike von Repgow wrote about the "Hofewart" as an estate guard dog in the Sachsenspiegel. They were also illustrated in writings in the 1400's tracking bandits. 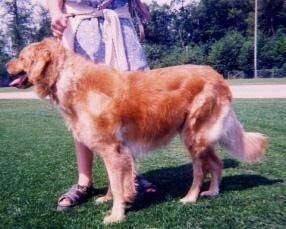 The breed almost became extinct in the 1200s, however by the 1920s a breeder by the name of Kurt Konig worked on a program reconstructing the breed. 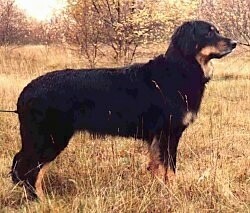 His efforts were successful and the breed was recognized by the German Kennel Club in 1937. Some of the Hovawart’s talents are watchdog, Schutzhund, search and rescue and tracking. "Along with Lucy, Leo is now part of our family. At 9 months old he is very sweet and sensitive. He is already a great watchdog but is friendly once he sees we accept someone. Leo gets along great with Lucy as well as our 5 year old cat Bella." 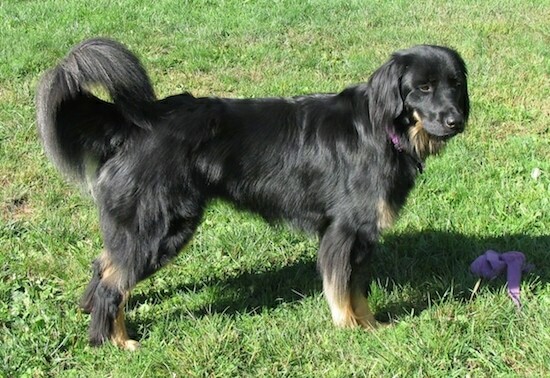 "Lucy is now 2.5 years old and has developed beautifully. She is sweet, playful and devoted but also watchful and protective. Hovawarts require a lot of patience and ongoing training. They respond well to praise and rewards along with a firm yet gentle manner. Lucy is 26" tall and 74lbs.."
Lucy the Hovawart at 8 months old—"Lucy is affectionate, determined, intelligent, active and protective. 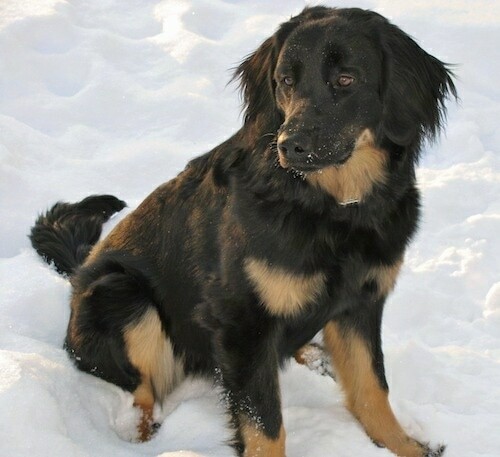 Like most Hovawarts she enjoys playing in the snow, long walks and being close to the family. She is responsive to training and does best using a combination of positive reinforcement and firm (but patient) alpha techniques." Jinkies the Hovawart at 6 years old—"I adopted Jinkies as a puppy from a local shelter after her original owners have moved from somewhere in the Northern US down to the coastal area. She was raised around many different cats and dogs, and seems to think they are all destined to be her friends. She is very loyal and kind, but also very loving and looks to me for guidance when meeting new people. She watches my body language closely, and seems to key her reactions off of me when meeting new people, going new places, etc. She has spent time with me living in Mississippi, Kansas, and Florida both with access to outdoor playing area, and lacking it without issue. She has become destructive when overly bored and lacking a job to do, but absolutely LOVED playing in the snow while I was in Kansas. 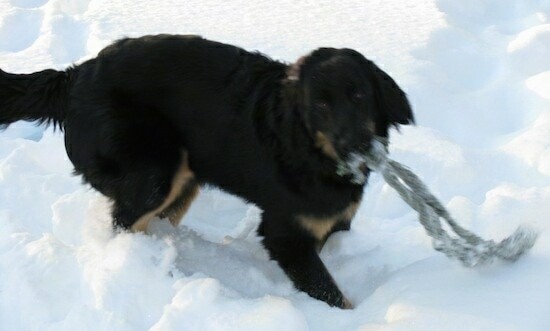 She seemed determined to eat every snowflake she could see and snap at, as well as jump in every bit of soft snow she could get to. I think her favorite pastimes are lazing about the house, and playing with any sort of ball I can find for her. A few kicks of her latest ball are typically enough to make her quite happy and satisfied, however she is prone to attempting to continue the game until she becomes too physically exhausted to continue if I will let her. I have had Shelties in the past, an Irish Setter, a Golden Retriever, and various mutts growing up, but Jinkies is by far the sweetest, lowest maintenance, easiest to get along with, and most generally enjoyable dog I have ever met! Visitors often tell me that she is the best dog they have ever seen as well (in terms of temperament, and general appeal to be around). She is still a very happy go-lucky dog, even now that she is nearly seven years old, and gets along very well with my wife's Italian Greyhound/Basenji mix. She prefers to be in the room with her masters, but infrequently seems interested in direct attention except for playing and mooching for food. She has always been ever watchful, although very passively monitoring. I noticed it especially with my wife when she was pregnant. Jinkies would even frequently stray from my side for the last few months to remain closer to my wife instead. It became common for Jinkies to come to alert and fetch me when my wife would become troubled or distressed in any way. Since my little one was born, Jinkies has resumed her general watchfulness by choosing to remain in the room and seeming to loosely keep tabs on everyone. She learned quickly not to get too close to our little one, because my wife insists that she stay at least a few feet away, but she has been very attentive to his rustlings and fussing, including being certain to try and get our attention if our little one begins fussing with a legitimate issue; Jinkies will consistently check with one or the other of us to ensure we are aware." "It started out so simply. I had come across the breed in a book years ago and thought they sounded perfect for our farm. I also pushed the thought of owning one out of my mind since they aren't very common in the United States. That being said, fate or chance decided otherwise. 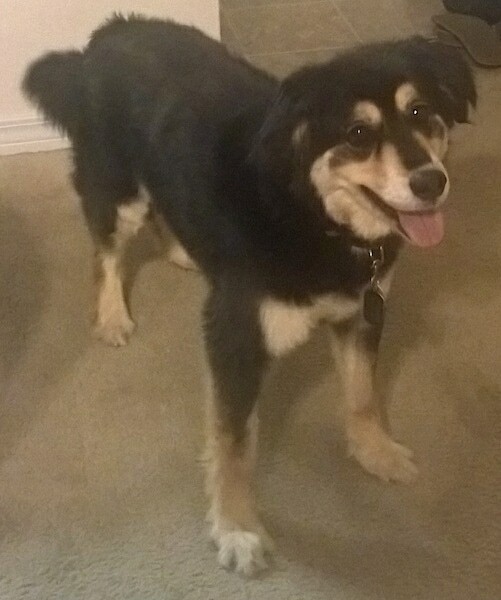 When the decision was made for our 14-year-old Shepherd mix to be put down, my mother and I decided to adopt a rescue dog and give someone a home who needed one. 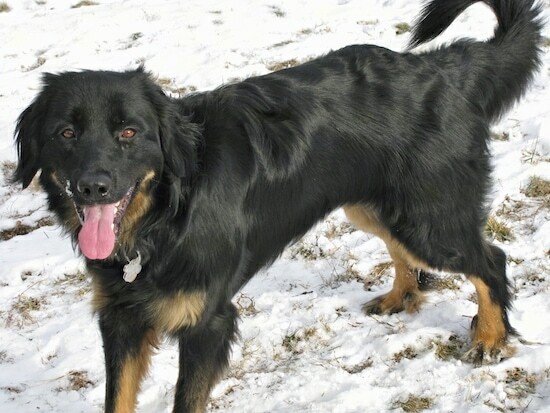 On a whim I looked up the Hovawart on Petfinder, just for grins. I didn't expect to find anything but three came up. 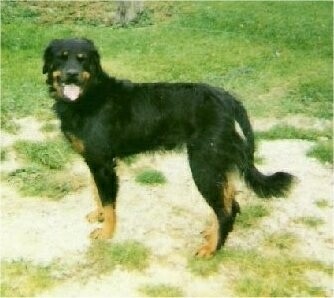 One of them was a beautiful 10-month-old purebred female Hovawart named Joy. Joy had been abandoned by her owners while on vacation in Idaho spring of '06. The former owners told the shelter they weren't coming back out for her and to do whatever they had to; they didn't want her. She had been given to them by their kids as an unwanted surprise. She had three days left in that shelter before being put to sleep. One of the employees there had a friend with a 2-acre kennel who would take dogs in from kill shelters and find them either non-kill shelters or homes. Bonnie was this kind lady's name and she had put Joy on Petfinder. The emails started going back and forth. 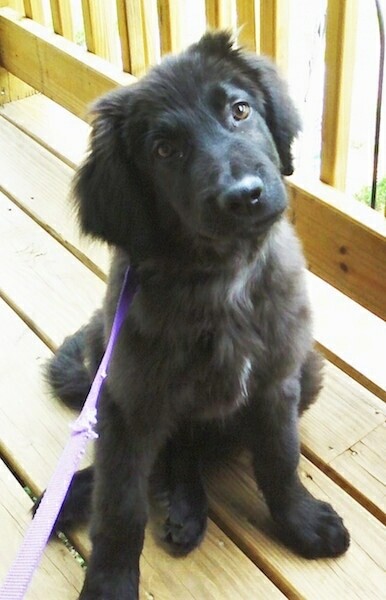 Through a lot of trial and trouble (She was in Wyoming and I am in Wisconsin), I had adopted her October '06. Two of my closest friends took my car (it had the best gas mileage) and drove to South Dakota to meet someone from the rescue halfway to pick her up. I could not go because it was too short of notice for my boss to schedule me off. She settled in and was able to be loose with our other dogs by about mid-December. We all really liked her—even my dad who is a farmer and doesn't usually get attached to animals. True to her name, she was a joy to have around and was a very "joyful," happy dog. I found out she loved playing fetch—which was great because it gave me a way to wear her out. Walks didn't work; I was the only one who came back tired. She even got to be "pals" with Swiffer, one of the cats. February she started running off and so we built a large kennel for her safety when no one was outside with the animals. Since someone was outside most of the time she didn't have to be in it much. Very, very sadly, Joy got out of her kennel while I was at work and was hit by a car. She had been running through the surrounding fields and was coming home along the road—judging from her footprints. She was less than 30 yards from the edge of our property and she had all her tags on but they never stopped and they never called. What upsets me the most was she was almost home and looking at her footprints in the dirt alongside the road they almost had to be trying to hit her. My pal Ryan, one of the two who went out to get her, helped me bury her out in front of the barn where she and my other dog Zeke liked to lie in the sun. Ryan said, he brought her to this farm, he just thought it was right that he help finish getting her where she was going. Joy is going to be very missed, much loved, and not forgotten." This is a blond Hovawart named Bonnie. 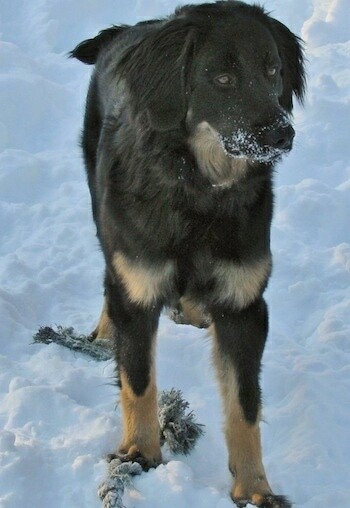 She is a 4year-old female Hovawart. She is 29.5" tall (75 cm) and weighs about 120 pounds (54 kg).